Have No Fear the Community Avengers are Here! 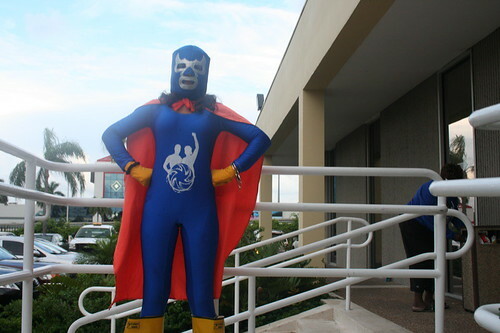 As the right wing mob mobilizes to shut down democratic debate on health care reform; as Van Jones is forced from the White House through distortions of the truth and plays on racial and political fears; as the recession deepens – the masked marauders known as the Community Avengers are swooping in to save the day. The Community Avengers are a team of residents from Miami who are standing up in these trying times, calling out the criminal bankers, and inspiring action. They have been spotted tumbling out of a van at a recent Miami Dade County budget hearing, moving into the seething crowd and taking to task politicians with their lively chants and street theater. After mixing with all those malcontented with proposed cuts to the Miami Dade County budget, the Community Avengers did a double header and headed over to a health care town hall for a show down with the riled up right wing. Just this week the Community Avengers joined forces with residents and pastors from Miami Gardens to fight back against banks bent on eviction rather than loan modification. Always on call to do battle with the villains of bad government and corporate greed, the Community Avengers rallied to support an ordinance that would sanction foreclosing banks. It is time for progressive people everywhere to learn a lesson from the Community Avengers. Let’s creatively mobilize and call out the culprits across the country. Where right wing pundits play on irrational fears, we will be there. Where greedy bankers rob our people, we will be there. Where government bows to a marginal and maniac minority, we will be there. You too can be a Community Avenger!